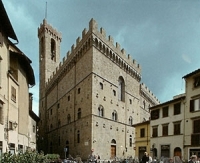 10 minutes walk from Hotel Loggiato dei Serviti in Florence, there's the Museum of Bargello, one of the most important museums in Florence and for sure the most important in the world as concerns Renaissance sculpture. You can find in there masterpieces by Michelangelo, Donatello, Ghiberti, Cellini, Giambologna, Ammannati. The above mentioned artists could be enough to astonish every art lover, or simply every lover of beauty, therefore we at Hotel Loggiato dei Serviti strongly recommend to our dear guests to vist the Bargello Museum.